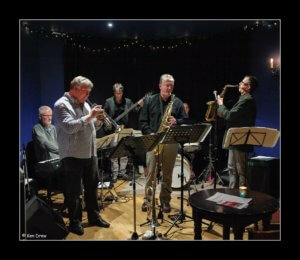 Since their debut performance in 2008, Alter Ego have entertained audiences at many North East jazz venues and festivals. The group draw much of their material from the rich catalogue of original compositions created by the likes of Art Blakey’s Jazz Messengers, Hank Mobley, and Miles Davis. The result is a stylistically varied programme including Up-tempo Swing, Hard Bop, Funk and Latin Jazz. The group’s instrumentation allows for tightly structured arrangements, with harmonically rich ensemble passages, exciting rhythmic interplay and inventive improvised solos from all band members.